The holidays are already a pretty stressful time for most people, what with all the cleaning, cooking, and shopping that needs to be done. Throw moving into a new home on top of all of these other tasks, and you’ve got yourself a pretty overwhelming situation! Don’t panic just yet, though. We’ve got some great tips to help you navigate moving during the holidays as painlessly as possible. Check to make sure your service providers are available for your moving date. Even utility companies, truck rental offices, and professional movers take time off around the holidays, so you’ll want to make sure that the services you’ll need will be available. Assess what you want to keep, what you want to toss, and anything that might need extra care when packing. This will give you a good idea of what you’ll need for supplies. Get yourself said supplies. A lot of department stores have plenty of boxes to give away year-round, especially during the holiday season. They often have certain days when they recycle their cardboard, so it’s worth it to check in and find out when that is so you’re not having to scramble and buy brand new boxes. Do your research on moving practices for your situation, so you can make the best plan of action. We have plenty of helpful guides right here, including our How to Move Awkward Items series and the Moving Day Survival Kit, complete with checklist! Packing and unpacking can be complicated, even when you’re not moving during the holidays. It’s wise to make a packing plan ahead of time, so that seasonal items that you might want to have for the festivities are the first things that come out of those boxes. Depending on how close to a holiday your move is, it’s possible that you’ll want to only unpack the most necessary things and leave the rest for after the celebrating has passed. 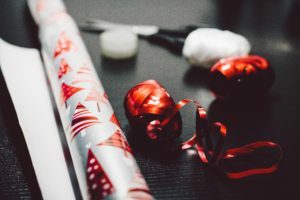 Items like cooking utensils, decorations, present wrapping supplies, and clothes for special occasions might need to be packed and moved separately to ensure you’re not having to rifle through boxes during an already busy time of year. We have some excellent suggestions for how to easily organize your packing in our post, 10 More Moving Tips & Tricks. Everything’s better with cookies and milk! Have some festive treats waiting as a reward for all your hard work–or sneak some while you’re going, to help keep up your energy! We know that moving during the holidays is a challenge, but hopefully these tips will help make the transition a little less stressful. If it all starts to become too much, take a deep breath and remember what the season’s all about. You’ll make it through! Do you have a holiday moving story? Feel free to share it with us in the comments below!